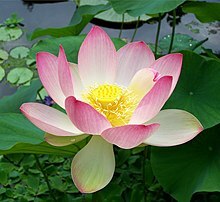 Nelumbo nucifera, an aw kent as Indie lotus, saucrit lotus, bean o Indie, or simply lotus, is ane o twa species o aquatic plant in the faimily Nelumbonaceae. Wikimedia Commons haes media relatit tae Nelumbo nucifera, Lotus an Lotus root. "Nelumbo nucifera". World Checklist of Selected Plant Families (WCSP). Royal Botanic Gardens, Kew – via The Plant List. This page wis last eeditit on 14 Mey 2018, at 16:31.